This post is a place for people to find a full list of all of the tunes I have available to the public. Information will be updated as I upload more tunes to the storefront. I will be tuning all cars in Forza Horizon 4. That being said, replies can be posted here if anyone would like to have a tune created for a certain car/class and I will create it for you as soon as possible. Here you can also find my contact info so you can get in games with me or message me, read about my experiences on previous Forzas, and discuss tunes that I have previously posted if you have suggestions for something you would like to have changed. If you would like to join me in game or have any questions, feel free to message me on Xbox! Note: This is a background of my previous experiences/knowledge of Forza. It is simply here to let you guys know about my background of the Forza game series to ensure you guys are aware that you are getting great, quality tunes from a player that has a decent bit of experience in the game. I do not mean to sound arrogant or boastful whatsoever. All tunes on the list below can be found on the in-game storefront. When in the tuning or upgrading menu on Forza, press the 'window' button on your Xbox controller, then click search. 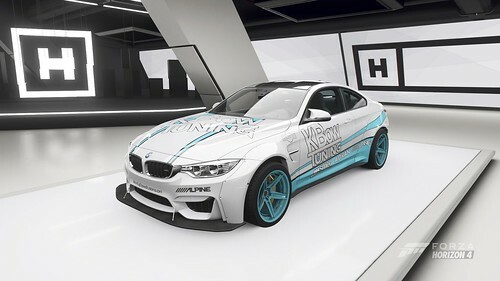 Type in my gamertag (KBowTuning), and my tunes will be right there available for you to download and install to the vehicle of your choice! You can also add me as a friend to see my tunes be one of the first to show up on the list of available tunes in-game. -At the Horizon Festival (or a house/garage), go to "Upgrades & Tuning"
-Go to "Find New Tunes"
Note: I'm aware the organization of this list is not amazing, I will work on formatting this post, but at the moment I'm just trying to get as many quality tunes out for you guys as I can and get them listed here so you know which ones are available. I apologize for this post being a bit messy, I appreciate your patience! Note: The list below is to keep track of tunes that I have removed/taken down and are no longer available for download in Forza. Tunes that have been removed may possibly be recreated in the future. Click Here to Visit My FH4 Tune List! Been using your tunes for awhile man and I am absolutely loving them! The handling & speed on the Bmw M3 in S1 is INSANE, been getting first place more than usual with it :) Would you mind making a S1 widebody Huracan for me? I'll get to work on that Huracan right after I post this next batch of tunes I've been working on! I'm happy to hear you're enjoying! I've been getting thousands of downloads/uses on the first batch of tunes I posted for you guys so I'm happy to see you guys are liking them! I'll post the latest tunes I've been working on below. Feel free to request new vehicles, I hope you have a wonderful day! I have tried your B class 69 Nissan Fairlady. And great job you did. It fits me perfectly. Looking forward to trying your others. Hello, I love your tunes. Looking forward to more! Unfortunately, my favorite car is the Alfa 8C Competizione and every single publically available tune I can find for it (S1) uses the spoiler, which I really dislike and think destroys the look of it. I'm hoping someone would be willing to post a good street racing s1 tune for it WITHOUT putting the spoiler on. Slim chance obviously but asking never hurts... would you be willing to do this? Or maybe if not you, someone else reading this? I don't mind creating one without a spoiler for you, I'll throw it on my task list and get it created for you when possible. I'm happy to hear you're enjoying! I'm very happy that you like the Fairlady, I'm confident you will enjoy the others as well. Thank you for the kind message! The S1 Widebody Huracan is now available for download, I'll add it to the master list soon. I hope you enjoy! Thank you guys for all the requests, my PMs are a bit blown up right now but I'm having fun making these cars. Alrighty, here's the list of new vehicles from the latest batch of tunes! Keep up the good work KBow! Tune is all done! I realized I forgot to ask you what drivetrain layout you prefer, but I had already been working on the tune in the default Rear Wheel Drive layout so I went ahead and worked on that so that I wouldn't come back to you with empty hands. The car is a bit grip oriented, but I'm more than happy to create another tune for you that is more speed/acceleration oriented if this tune isn't quite to your liking in that regard. I'm confident you'll enjoy this tune. Car is a S1 Class Street Grip tune with no aero, just as you requested! As always, don't hesitate to let me know if there's anything else I can do for you. I'm always happy to help! I had much fun testing and tuning this vehicle, thank you for the request! Thank you! I greatly appreciate the kind words! Loving the Hellcat. It's a bit heavier than I'm used to, but once you figure out slow and deliberate movements are the key it's a great car. I'm not seeing it on the list, but do you have one for the Skyline GT-R VSPECII? Hi,I remember using your tunes in previous forza games,I’ll be sure to search for you next time I’m on,thanks. I love the grip tune on the 8C. When you get a chance would you mind building the speed/acceleration variant? I'm really interested to see what this baby can do. Thank you! Thank you very much! That is so kind of you. I'll download it right away later and give it a spin, I'm sure I'll be more than happy with it, no spoiler and S1 class is all I wanted and grip oriented is great. Once again, thank you! Yeah, the hellcat has a bit of weight to her, but she comes blazing out of corners and recover quickly. I'm glad you are enjoying! I'm more than happy to make one, what class would you like the car to be built for?